Maybe one of the reasons you invested in a new artificial grass lawn was because it requires little maintenance. This is true but there are some regular and not so regular tasks that you need to carry out to keep your grass in pristine condition. Here I will show you how to look after and clean your artificial grass lawn throughout the year. If you would like us to look after your lawn we offer some affordable artificial grass lawn maintenance packages starting from under £50 for the year. To prevent debris such as leaves, sticks and soil building up on your artificial grass we suggest you use a blower once a week in the Autumn and once a month for the rest of the year. A stiff broom or a plastic rake will do the trick if you don’t have a blower. We don’t recommend using a metal rake as this will damage or pull out the grass fibres. A hose down with water a couple of times a year or when necessary will also help. The British weather will do the rest! If you choose to use a pressure washer to clean the grass we suggest you spray the grass gently from a distance. Do not try cleaning the grass like you would a patio as this could damage the grass fibres and could also damage the base of the lawn. Keep bird feeders well away from your artificial grass. These will only encourage droppings to build up and rodents to dig at the grass below the feeder. Remove any dog mess or urine with a hose. Because the grass is porous there is no risk of flooding. 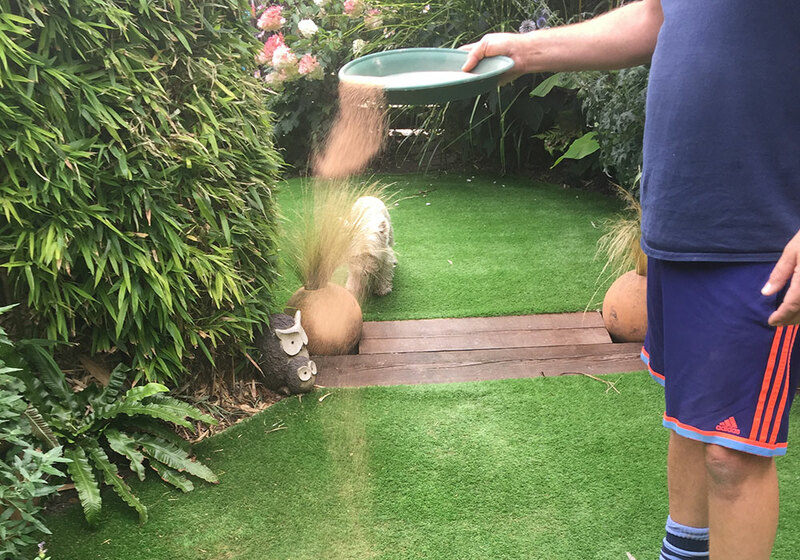 If you do have an issue with your grass smelling of dog wee we highly recommend using our unique ‘Dog Wee Sand‘. It took us many years trying and testing a whole variety of products before finally coming up with this relatively simple solution. Give it a go it works. If your lawn is walked on regularly the grass fibres may become flat. 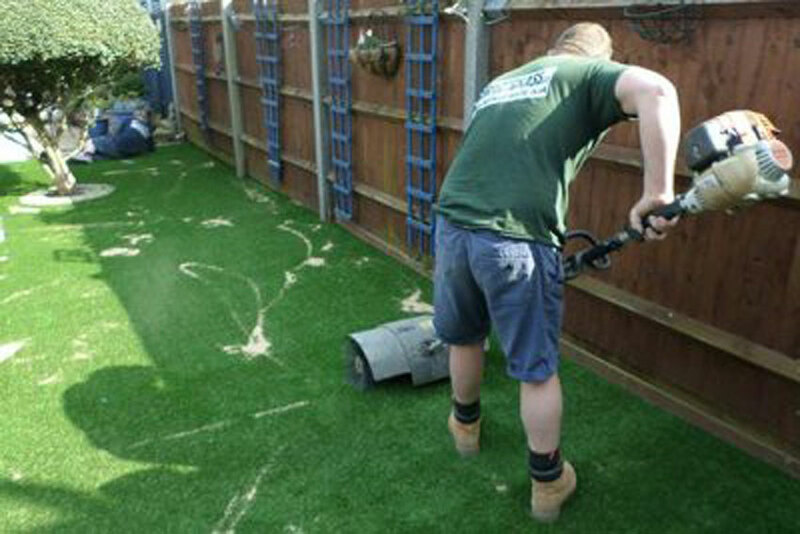 In such cases we recommend that you brush some sand infill into your artificial grass to raise the fibres. If you have a large lawn a power brush can be rented from a Hire shop to do the job (see photo below). For smaller lawns or for those people on a budget a plastic leaf rake will do the job perfectly well. 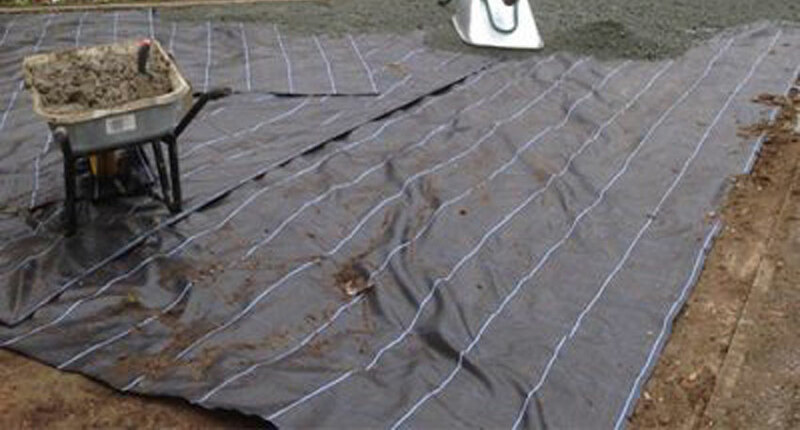 Weeds should not come through your grass because a membrane should have been placed beneath the surface. However there are always weed seeds in the air that can land and germinate in your grass or grow up the sides (this is why we always make it clear it is 90% effective at preventing weeds). If you do have a few weeds in your grass you can simply buy a weed killer that is fine to use with synthetic grasses. The weed killer spray we often use is Roundup. Make sure that you spray on a dry calm day so the rain does not wash it away or blow it on to your plants that are surrounding your lawn. If you want your artificial grass to smell like the real thing then add some artificial grass cleaner to it and brush it in. These grass cleaners often contain the chemcial compound cis-3-Hexenal. This compound is a colourless liquid that has an intense smell of freshly cut grass. Mixed with other ingredients and bingo you are able to deliver that freshly cut grass smell. We don’t recommend using these products to cover up the smell of dog wee for example as we have found it results in a dog wee grass smell. It is best used like a perfume; You wouldn’t apply perfume or aftershave without washing first! There are certain steps we recommend taking to look after your artificial lawn during the winter months when there is very cold weather or snow. To get rid of snow from your lawn I advise using a plastic snow shovel to take away the bulk of the snow and then using a broom to get rid of the rest. It is not recommended to use salt as this will leave grit on the grass and may cause discolouration or potential drainage problems with the grit blocking up the escape for water. There is no harm in leaving the snow on your grass either. In fact the snow can work for you and give your grass a good clean. Just remember to use a plastic leaf rake or powerbrush to lift the fibres up once the snow has melted away. 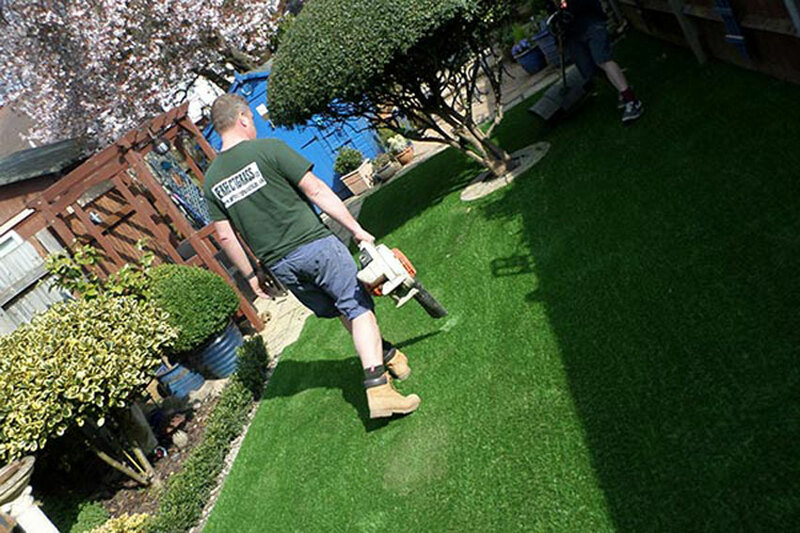 Unlike real grass lawns that will look muddy, grey and awful after snow your artificial lawn will look great again. Artificial grass is a very durable product and even if temperatures plummet to -10°C or less it won’t freeze and become brittle. What might happen is water may be present on the grass fibres and this may then freeze. Like any other icy surface this will become slippy so we do suggest you excercise caution when walking on your grass at times like this. If you really don’t want to have any snow accumulating on your grass there are a couple of options open to you. Firstly the budget option is to cover your lawn with a plastic tarpauline before the snow begins. Once the snow stops you can remove the plastic sheet and voila a beautiful green lawn awaits. If you are a Premiership footballer and you have a generous budget the second option would be to install an artificial turf heating system. This would raise the temperature of the grass to prevent any snow from settling in the first place. Many football clubs use this to allow play all year round. I hope these tips will help you keep your artificial grass in prime condition. I will be happy to discuss maintaining your artificial grass in more detail following the installation of your artificial grass lawn. If you have any further questions please leave a comment below. Hi There Gavin. At the moment we have round stepping stones on our grass. Could stepping stones be cut into artificial grass. If there is no path would the grass look worn after walking on the same route back and forward to your garden shed over the years. Lastly how many years should a good quality artificial lawn last looking good. Hi you can have stepping stones by all means but they create a lot more groundworks and fitting issues. We always advise against them but if you insist on keeping them you will need to put a concrete fillet around each of them so you can cut and stick the grass , which will prevent any issues arising like worm-casts , weeds and maybe the grass becoming loose causing a trip hazard. The most important factor in long lasting grass isn’t the amount you pay for the product its the effort that has gone into the base. The most expensive grass on the market will only look as good as the groundworks put beneath it. We generally say 0-5 years it will look amazing 5-10 years you will see some movement and the grass will start looking slightly tired and then to be replaced at the end of this time. However a lot depends on footfall as the grass will actually last for 20 years if needed but it will act the same as carpet and generally it will be replaced once it looks tired. Please remember if the groundworks are done correctly the first time then second time around the cost should only be for removing grass, re timbering the fixings and adding some granite dust and rescreeding. Pigeons in particular but other birds as well leave their poo on our grass which is a cirlce 5m in diameter so quite a large area some of which is under horse chestnut and robinia trees where the birds perch. What is the best way to clean bird poo which has hardened etc. Hi I would use a pressure washer lightly on it mixed with maybe some diluted soap mixture. Hi we have artificial grass. When building a fence some soil has been left on top of the grass which now has weeds growing in the soil. How can we get rid of the soil. I have tried raking the soil but it seems like the soil is stuck in the grass. Do you have an agent in Scotland. I would like someone to lay the grass. Hi there sorry we don’t , we only install in areas we can check local to us that the install quality is up to our standards.